Many riders are on the road and in route to the Sturgis Rally. 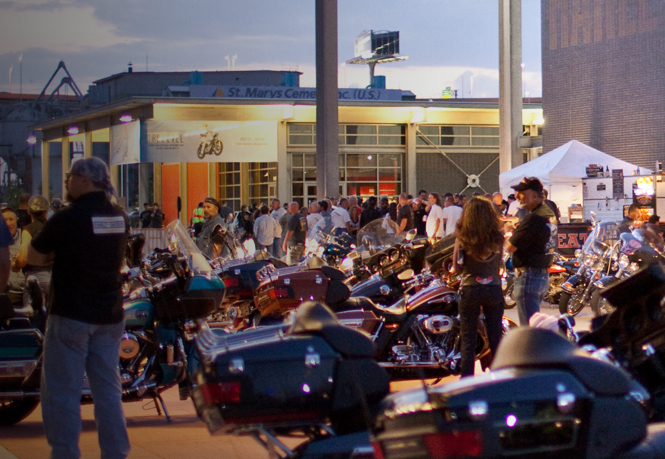 If you rushed out of the garage before finalizing a list of things to do while in S.D., below is a list of activities Harley-Davidson will be rolling out for rally attendees. The 2015 models will not be launched at Sturgis. Last year the motor company started a new trend of introducing the new model line up during the 3rd week of August after all the press/media noise subsides post-Sturgis and they can garner more mind share. H.O.G. Rally Point – Join Tina, Thor and other H-D staff in the H.O.G. area. Pick up your FREE event Pin, join the club or renew your membership. Plus, August 2-8 all H.O.G.® members + one guest are welcome to join us in the H.O.G area from 3:00pm – 5:00pm for live entertainment, complimentary samples of our new H-D Road House Meats and beer samples. Willie G. ® and H.O.G.® Commemorative Merchandise – You can’t buy it at home! Stop by to purchase exclusive Sturgis 2014 clothing. Genuine Harley-Davidson® Parts & Accessories Display – the latest Harley® models equipped with the full line of custom Parts & Accessories. Check out our 12 fully accessorized bikes! 2014 H-D® Motorcyle Lineup – Check out the 2014 bikes, including NEW customized Street ™ motorcycles, RUSHMORE bikes, the Low Rider® and the SuperLow®1200T. Women’s Area – Rebel One hosts the JUMPSTART® Rider Experience and Bike Lift Seminars on how to properly lift a dropped motorcycle. Enter the sweepstakes to win a FREE Riding Academy course or Rental. Weber® Mobile Grill Academy – Get a first-hand look at Weber grills and accessories; Weber Experts will be there to answer any questions you may have about grills, grilling techniques, recipes, and all things grilling! Join the Weber Family by signing up for Weber Nation and you will be entered to win a Weber Genesis gas grill. Craftsman® Garage Station – Come for a free oil fill-up and tire pressure check! Stay and watch our artists sculpt, paint, and engrave. Take home a cool new design on your bike helmet or a personalized engraving on a free Craftsman cap wrench. Free Bike Wash – Wash away all the Black Hills dust and dirt at the free bike wash from 9am – 4pm. Just bring a dirty bike and a little elbow grease. MDA will sell event pins and host a bike raffle. Enter to win a black 2014 Street Glide! Visa will offer Visa Card membership application and free giveaways to all applicants! Harley-Davidson ® Motorcycle Test Rides – Take a FREE test ride on a 2014 Harley-Davidson® motorcycle, including our new RUSHMORE bikes, LowRider® and SuperLow® 1200T. Come early and ride as many bikes as you want. All riders must have a valid motorcycle license and adhere to riding gear requirements and safety rules. Demo registration will close at 4:00pm daily. Harley-Davidson® Motorclothes® – Try on our new jackets – even take them for a test ride! All items will be available for immediate purchase. H-D1™ Fit Shop – Come experience the feel of a more comfortable, safer ride. Stop by the H-D1™ Fit Shop and find your perfect seat and handlebar combination. Sunday, August 3 – “Weber® Big Burger Battle Cook-Off” competition. Come to the Weber® display at 3rd and Lazelle St. to watch pre-selected finalists compete in a cook-off! Tuesday, August 5 – The 6th Annual Women’s Biker Belles™ Ride and celebration sponsored by Harley-Davidson®. Visit www.bikerbelles.com to register and for more information. Wednesday, August 6 – “Weber® How to Grill a Perfect Burger” hands-on grilling class exclusively for H.O.G members led by Weber® Grill Expert, Kelsey Heidikamp. Classes offered at the Weber® display at 3rd and Lazelle St. at 11:45am, 1:30pm, and 3:15pm. To participate, please send your name, cell phone number, H.O.G. number and preferred class time to HandsOnGrilling@harley-davidson.com. Space is limited so sign up soon! Sign up ends Friday, August 1.